With acid-resistant stainless steel juicing cone, you can forget about any aftertaste in your drink. A dual switch feature provides absolute safety of use. It's recommended to wipe detachable parts clean to prevent drop marks. 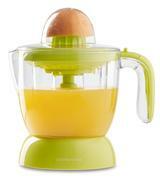 You can hardly find a better citrus juicer if you're looking for a productive, safe, and simple model. Get this Sage by Heston Blumenthal appliance and enjoy drinking fresh citrus juice! The 1-litre capacity guarantees enough mouth-watering beverage for a small company. Easy-to-pour spout will help you share juice among your guests equally. Light body gets stained easily. Enjoy the juiciest beverages! 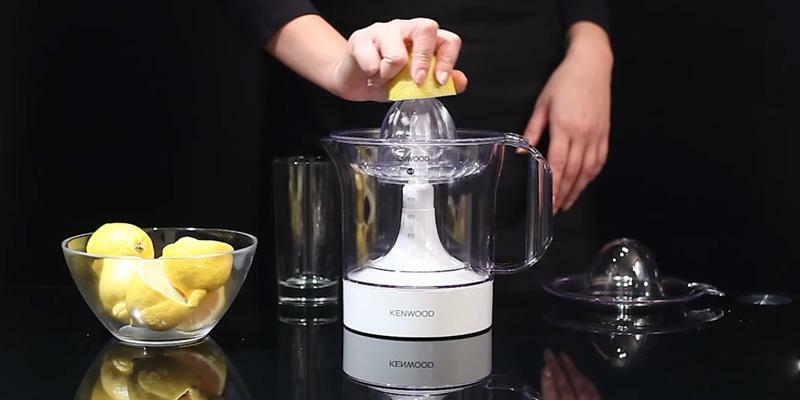 Owing to a two-way rotation, Kenwood JE280 will extract every last drop of citrus leaving only dry pulp. 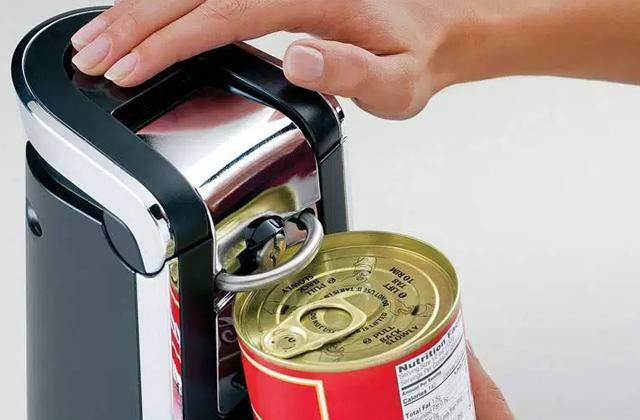 2 squeezer attachments are changed effortlessly. 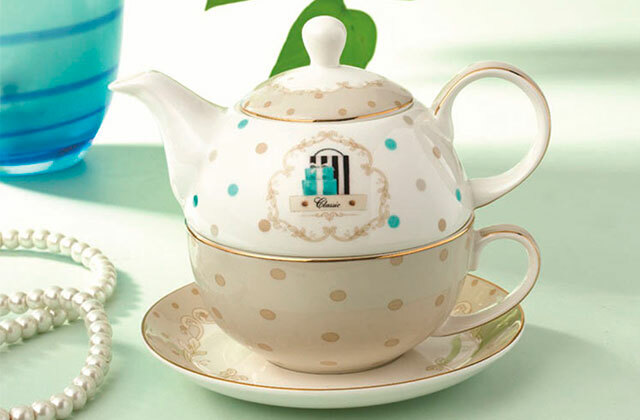 And with a wide spout, your kitchen countertop will always be spotless. The filter is clogged with hard particles quickly. 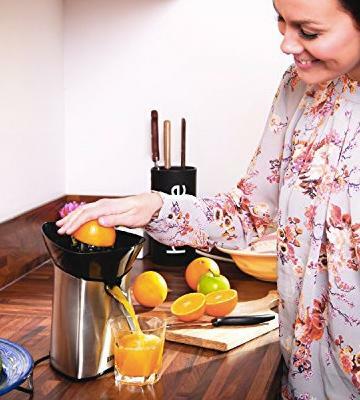 If you wish your citrus juicer not only to perform its main function properly but also please you with usability, VonShef appliance is just what you need. 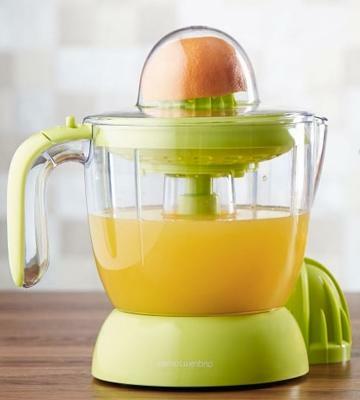 Due to a relatively small size and detachable parts, you won't face difficulties cleaning your juicer. It might be inconvenient to fill the glasses which are higher than 12 cm. With Duronic electric juicer, canned drinks are going to become just a history since you can make refreshing beverages anytime you wish! The model with a plastic body and juicing cone is also available. Adjustable filter enables you to control how much pulp gets into your juice. Motor power leaves much to be desired. 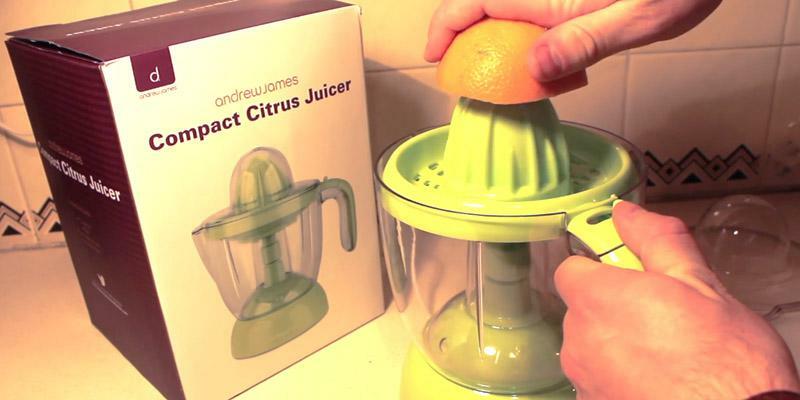 Thanks to the Andrew James Citrus Juicer, you will not only drink fresh and vitamin-rich juice but also enjoy the process of juice making! 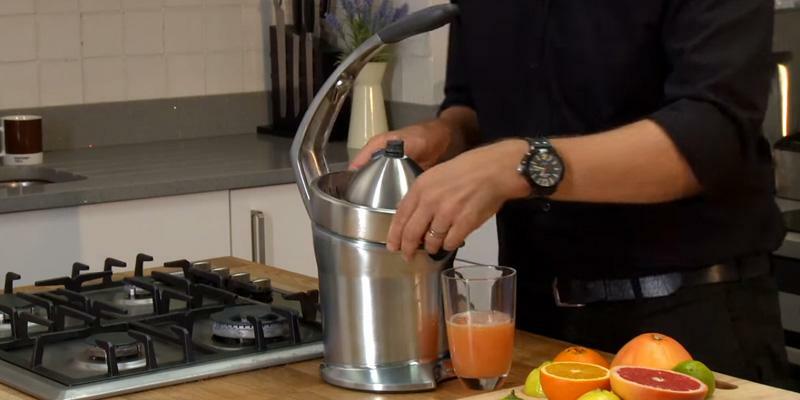 The Sage by Heston Blumenthal citrus juicer seems ordinary at the first sight. However, after a close consideration, you’ll notice that not only its body is made of stainless steel but juicing cone as well. Due to this material and incredibly powerful 110-Watt motor power, the Sage by Heston Blumenthal press is capable of extracting the maximum amount of liquid from any fruit. Moreover, the cone is acid-resistant, thus, giving you a pure citrus flavour without unpleasant metallic aftertaste. Pay attention to usability and ease of use of this model, too. The unique patented design of a rubber pull-down handle allows you to squeeze juice from oranges, lemons, limes, and other fruits without any effort and saves you from dirtying your hands with sticky liquid. And thanks to the drip-stop function, your kitchen table will always be clean. Finally, the manufacturer has taken care of your safety and equipped its appliance with the dual switch system. To put it simpler, the Sage by Heston Blumenthal press starts working only under two conditions – positioning the handle down and producing some pressure on a juicing cone. 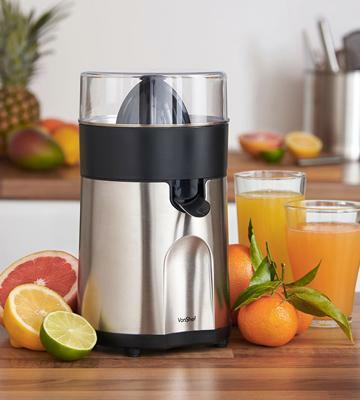 So, if you want a perfect juicer to make refreshing drinks of fruits of any size, it’s time to consider the Sage by Heston Blumenthal citrus juicer. 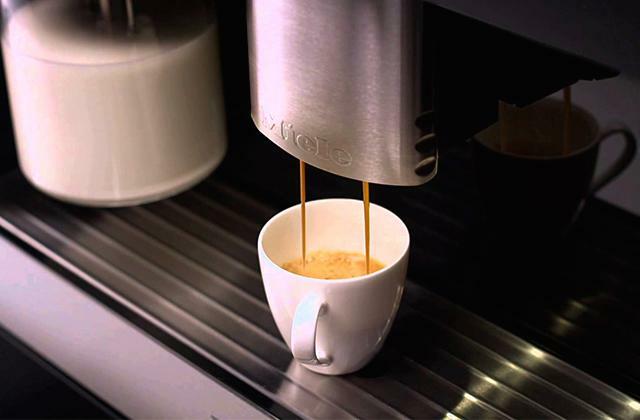 One of espresso machines described in our review will definitely come to your liking if you have a habit to start your morning with a cup of aromatic coffee. Eating fruit and vegetables is crucial for human health as they contain lots of vitamins and nutrients our body can't live without. 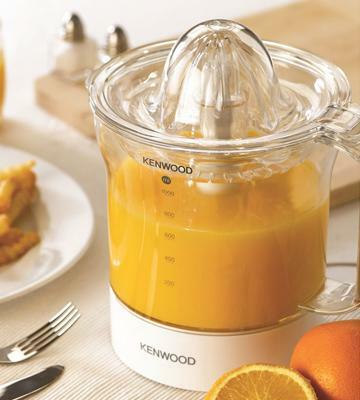 The Kenwood JE280 citrus juicer can squeeze the maximum amount of vitamins from your favourite citrus fruit! 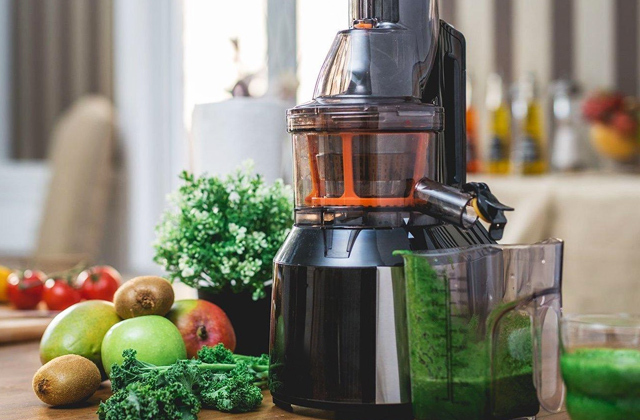 The 40-Watt power of this appliance and the unique two-way rotation technology extract every drop of juice, leaving nothing but dry pulp. The container capacity of 1 litre lets you produce enough beverages for a small family or a group of friends. You can treat your family members or guests to fresh juice as soon as you squeeze it or put it in a fridge for later. To preserve citrus juice with better convenience, it’s recommended to use a lid included in the box. The last but not the least feature to consider is the ease of use. (Dis)assembling the citrus juicer takes mere seconds and all detachable parts are totally dishwasher safe, so you don't need to wash them manually (which is a real torment for lots of people!). 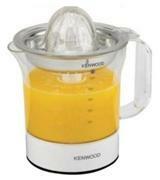 All in all, by choosing the Kenwood JE280 citrus juicer, it’ll be easy for you to make a glass of vitamin cocktail anytime you wish. Since you need to prepare fruit for juicing in advance, you cannot do without a high-quality knife. 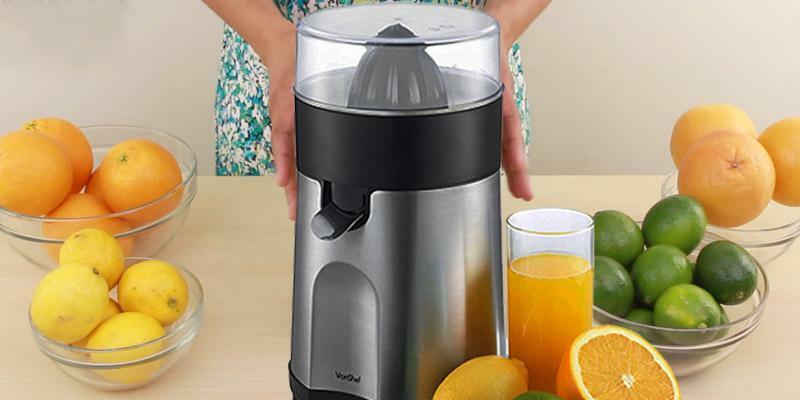 If you’re looking for a simple yet functional citrus juicer at a reasonable price, we would recommend you to consider the VonShef Premium Electric. The first and foremost feature to take notice of is two interchangeable squeezer attachments which allow you to obtain citrus extract regardless of fruit size. No matter what you want to squeeze juice from – tiny limes or large pomelo – this appliance will perform its task perfectly. 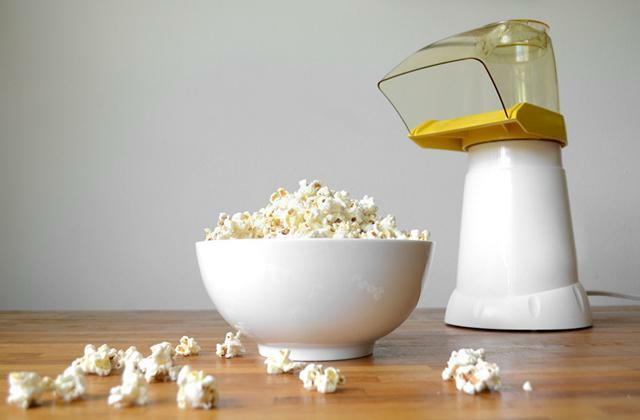 The drip-stop spout is also worth your attention since it lets you leave your kitchen countertop dry and spotless by preventing drops from falling there. 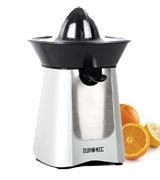 Finally, VonShef Premium Electric juicer features dust cover to protect a juicing cone from harmful tiny particles. Although container capacity of the VonShef Premium appliance is only 0.2 litre, don’t let this tiny detail spoil your impression of this juicer. Opt for this model and you’ll see how many useful features it really boasts. If you still do the dishes by hand, we would like to turn your attention to countertop dishwashers. 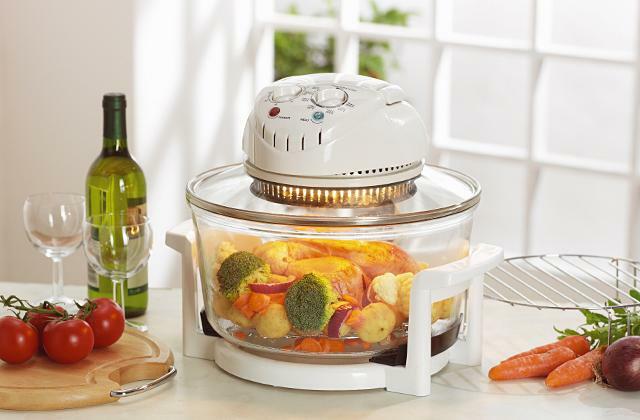 These kitchen appliances are compact and easily assembled, and, what’s more importantly, they save your time and efforts. Speaking of Duronic JE6SR, the first thing that catches our eye is its stylish design. 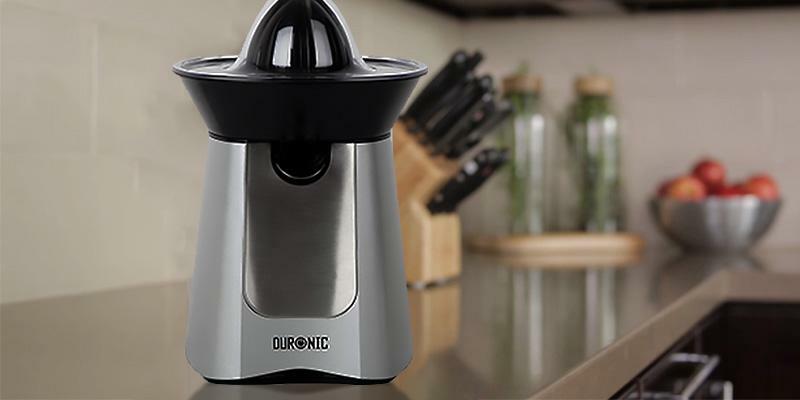 This juicer is made of stainless steel and plastic – perhaps, the most suitable combination to make kitchen appliances more durable. Besides, these materials guarantee a hassle-free cleaning and maintenance of the citrus juicer. Plus, designed in a stylish manner, the Duronic JE6SR will definitely find its place in any kitchen. Pay attention to its usability, too. First of all, you can fold the power cord and hide it in a storage area at the bottom of the appliance when it’s not in use. It will ensure your safety and add to the aesthetic look of the juicer. Secondly, it’s easy to operate it. All you need to get a glass of mouth-watering fresh drink is to set the necessary squeezer attachment and press a fruit onto it. Note that the appliance starts working only when you press juicing cone. This well-thought-out feature ensures a low energy consumption as well as your safety. One more thing to take into account is that the Duronic JE6SR is equipped with non-skid feet, a guarantee of its stable position even on an exceptionally smooth kitchen surface. Before squeezing a citrus fruit, you need to cut it in half first. To perform this task with the maximum convenience, you'll need a good cutting board. 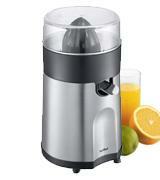 If you are a devotee of low-noise kitchen appliances, the Andrew James Citrus Juicer is what you really need. Its incredible quietness is determined by the 30-Watt motor. Although this number is much smaller in comparison with its rivals, it doesn’t mean that the Andrew James model works inefficiently. 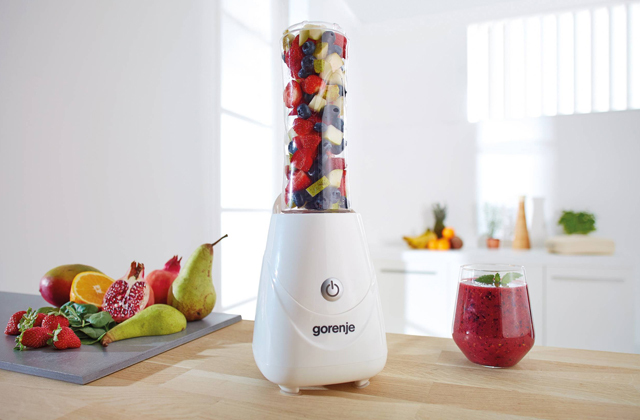 Quite to the contrary, it is capable of juicing 10 fruits in one go! And even if you wanted to have a glass of juice in the morning, you could easily have it without waking up your all family. One more feature that cannot be underestimated is the adjustable filter. 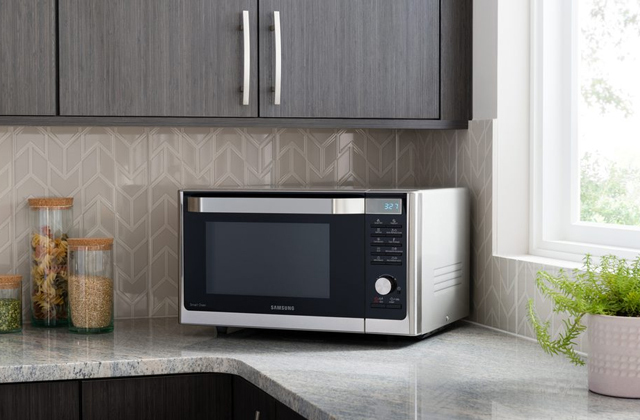 It was designed to please every user of Andrew James appliances. No matter what kind of juice you prefer – with pulp or without it – you’ll get what you want by adjusting a hole size in the filter. So, if you want your citrus juicer to be functional and silent, it’s time to buy the Andrew James Citrus Juicer and forget about canned drinks forever. 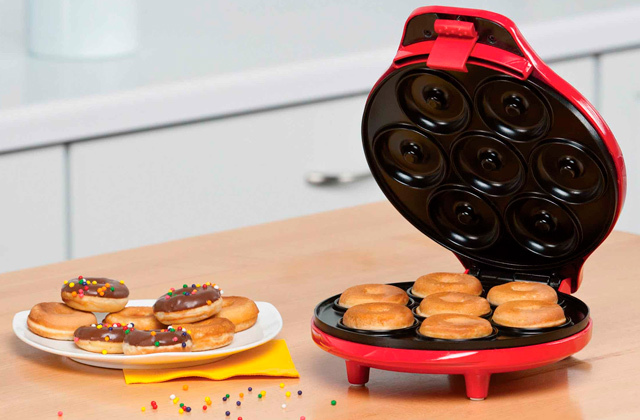 To make your breakfast even more delicious, think about getting one of the best-selling toasters. 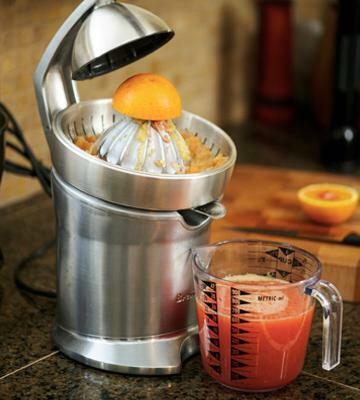 An electric citrus juicer is a popular appliance used to extract juice from fruit at home or in a bar. One glass of fresh orange juice contains a daily portion of vital nutrients, including vitamin C, required for a human body. Besides, citrus juice is often a part of cocktails and that makes juicers even more popular. In general, modern juicers can cope with small and large fruits effortlessly, so you can extract juice from grapefruits, pomelos, limes, etc. Consider our review of the best citrus juicers available on offer today and treat yourself and your family to fresh nectar from mouth-watering fruits delivered from all the corners of the world. Right before we move further on, we'd love you to check out our pick of the best margarita machines for creating differently flavoured and coloured cocktails. 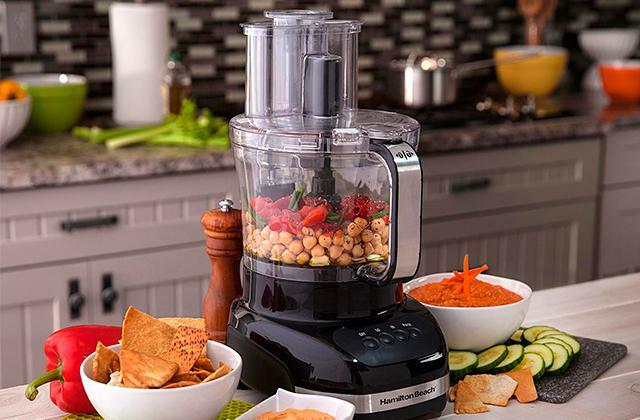 If you like preparing homemade smoothies for your friends and family, you might also want to take a sneak peek at our review on the best smoothie makers. The very first thing to check out in a citrus juicer is its Type. Electric models have an electric motor and work at 110-120V allowing you to squeeze one fruit after another. Mechanical or manual juicers, obviously, don't have a motor, so you just press, roll, squeeze, and squish a fruit as much as you can onto a reamer with your hand or some kind of holder. Generally, we recommend buying an electric juicer as they are way more efficient, faster, and easy-to-use than another type. Usually, both types are designed for processing large and small fruits with just one universal reamer, but sometimes a device comes with a set of 2 cones of a different size for fruits like tiny sweet tangerines or large red-cheeked grapefruits. Take a look at the Motor Power of electric models. The bigger this rate, the smaller the chances that it will jam or slow down while you are pressing the reamer down with a fruit. 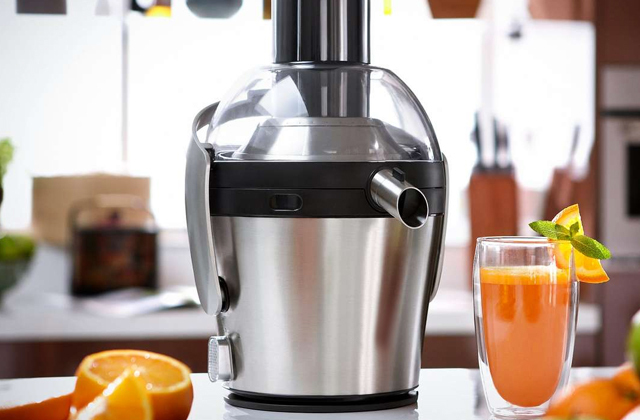 You may find juicers with up to 200W motor. Yet, those with 25-180W yield are pretty enough for most average users. Remember, 1 cup can contain about 8 oz. of liquid. To fill it, you'll need 2 or 3 average-sized oranges. Instead of constantly keeping a glass in front of the appliance, some of them have a special container to collect and discharge exotic juice after processing several fruits. That's why you might want to check out the Container Capacity. The bigger it is, the more juice you'll be able to collect without emptying it. By design, however, many models have a comparatively small reservoir for only one or two glasses. Another issue to consider is the Material. By design, they should be acid-resistant, food-safe and, of course, stylish. The most common materials are stainless steel and hardened plastic. Metal is a great choice if you are looking for a heavy-duty model. Nevertheless, the plastic in such devices is usually thick, sturdy, and made to withstand the acidic environment. In simple words, it's rather a matter of appearance than functionality- choose the size and the colour that you think will look awesome on your kitchen table and go for it. Also, check whether its components are dishwasher-safe or not. Finally, you might find various Extra Features that can make juice extraction even easier. Examine the controls - in some models, you activate the motor by pressing sourish-sweet citrus with hand onto the reamer; in others - press it down with a special dome attached to a lever. There might also be a special switch-up spout to collect the juice in a reservoir and then open it to fill a glass right away. And that'd be all of the main features. 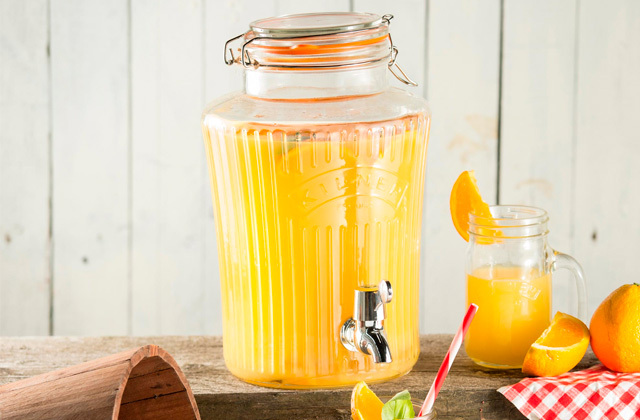 So, let's take a closer look at our pick of the finest electrical devices that will surely help you fill your glass with appetising citrus juice. Attention! 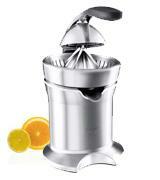 The following review of 5 awesome citrus juicers may cause an excessive mouth-watering effect. Read with caution! 1. Orange Juice: Health Benefits, Nutritional Value & Calories, Organic Facts. 2. Melanie Greenwood Orange Diet, LIVESTRONG. August 21, 2015. 3. Juicing, Wikipedia. July 25, 2016. 4. Alan Henry How to Get the Most Juice from a Citrus Fruit, Lifehacker. May 22, 2012. 5. Juicing benefits: 7 Reasons Why Fresh Juice Is The Healthier Option, The Huffington Post. March 23, 2014.